While blog posts were once a prime domain for influencer marketing efforts, brands are increasingly targeting specific platforms—and Instagram has emerged as the primary choice, according to “Major Insights From Micro-Influencers,” a survey of 400 micro-influencers conducted by Atlanta-based Everywhere Agency. About 80% of the micro-influencers surveyed reported an increase in platform-specific campaigns and the majority of respondents, 58%, cited Instagram as the most requested channel from brands. Not a single respondent mentioned Snapchat as a platform they’re asked to exclusively focus on. One of the biggest trends in influencer marketing is the shift away from high-profile celebrities and toward micro-influencers—people who may not be household names but whose opinions hold sway over a targeted audience. The survey, which polled micro-influencers with a minimum of 25,000 followers, looks at the most effective tactics for courting these advocates, what content is resonating the most and how much are they're typically compensated. Maybe it should come as no surprise that Instagram, the most visual social platform, is seeing the most influencer action. 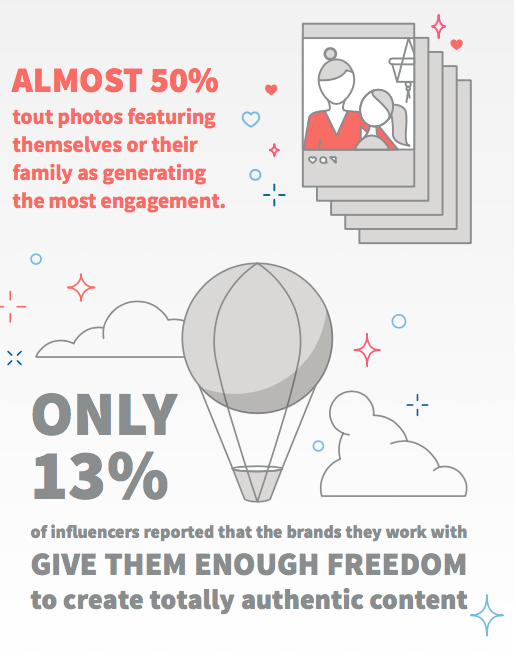 In fact, nearly half of the 400 influencers surveyed said that photos featuring themselves or their families generate the most engagement. After all, what’s more authentic than a personal pic? Yet, the issue of just how much control an influencer is allowed to have over their content remains a contentious one. Just 13% of influencers said that the brands they work with give them enough free rein to create totally authentic content. "It’s disappointing that even today, only 13% of brands are giving influencers the creative freedom they need to create organic content," says Kombol. "Smart brands who deploy influencer marketing do so because they are looking for rich, authentic content. There should be a good give and take between the brand message and the influencers' natural storytelling ability." Another surprising finding concerned how brands use the content. Less than a quarter of respondents say that the organizations they work with repurpose the content they're paid to create, representing something of a lost opportunity for brands. And what micro-influencers are getting paid also continues to rise. More than 65% of influencers reported an increase in rates from 2016 to 2017. About 20% of those surveyed reported charging $400-$500 for a typical campaign involving a blog post and social shares. Among the biggest pet peeves of micro-influencers uncovered by the survey are pitches that are clearly irrelevant to their fields of expertise, and highly impersonal, blanket-pitch emails. So, Kombol suggests making all outreach efforts personal, tailoring the message "whether that’s commenting on their cute baby or how delicious the last recipe they featured looked," she says. "No matter how tempting, avoid the urge to send a BCC email to a flock of influencers."